Remember back in May when a water main burst on Elgin? I happened to have gone by when they were repairing it, and naturally I took some photos. They were doing a five-inch-thick layer in one pass. If you look at the surface of the section they are paving over, it's actually pretty hard to tell where the big hole was. Hopefully that will mean that this section won't settle and get all bumpy. And here's the finished product a week later, painted and smooth. Nice work! This one's outside of Centretown, but I'm sure the many arts afficionados in Centretown will appreciate it. The Gladstone theatre opened recently. After seeing this lovely photo on CBC Online, I decided to head down to take some photos of my own. The photo taken above depicts a portrait of Marion Dewar in the middle of Ottawa City Council chambers (Andrew Haydon Hall) this past Tuesday. The portrait is flanked by the current and former flags of the City of Ottawa. In front of the portrait is a table, upon which is a book for signatures and condolences. I only met Marion Dewar once. It was in the cloakroom in the wet morning of the first Imagine Ottawa Social Forum in September 2006. We had both arrived early; she and I said hello. During that forum, which was just over a month before a municipal election, she gave what remains the most rousing and optimistic speech I have heard on the topic of municipal politics. No doubt a new generation of activists was inspired that day. While I arrived at City Hall today in the early afternoon, after much of the pomp and ceremony had taken place, the building was still abuzz with Ottawa's who's-who. The Citizen's Randall Denley bristled pensively into the cafeteria. Former mayor Bob Chiarelli chatted with Councillor Diane Deans in the foyer. Two journalists chatted outside the Lisgar entrance on a smoke break, while other people I recognized stood in line. The decorations were dignified and momentous, but not overly extravagant. Walking into City Hall, I was immediately welcomed by the soothing sound of a violin duet playing Pachebel's Canon, while a red carpet, bordered by velvet rope, guided friends and wellwishers from the Laurier Street entrance, past a display of memorabilia from Ms. Dewar's life and mayoralty, and into the open space of Jean Pigott Hall. Various members of the Dewar family greeted visitors at the entrance to the main hall, though Paul--the only one I know personally--was away when I passed by. This day also had significance in my own life, as it was the anniversary of the death of my own mother, who herself was a leader in a field dominated by men. That gave me a lot to think about during my visit. I felt a bit awkward there, as I was among the youngest, clearly not one to have had the opportunity to know Ms. Dewar very well. I occasionally looked over my shoulder in search of familiar faces, and when I found one, I nodded quietly. I had learned much about Ms. Dewar since first hearing her speak, and it was important to me to honour this woman I had come to respect. The casket was draped with the City of Ottawa's flag, a single yellow rose resting upon it. Two boquets of white roses stood on tall, thin tables on either side. Unseen in the Citizen's photos, a wall of alternating Canada and Ottawa flags lined the front edge of the reflecting pool. The weather cooperated magnificently, with the sun shining brightly in, highlighting the words "ex oriente lux" inscribed on City Hall's East window, the scene serene and peaceful. Two formally-dressed firefighters stood, bowing their heads, at the corners of the casket. On the hour, the guard changed with two paramedics in formal dress took their place. Passing the casket, I followed the queue along the carpet toward the table with a book of remembrance, which had been moved out of Council chambers and into the Southwest corner of Jean Pigott Hall. I tried my best to ignore the chatter of an elderly gentleman behind me who was striking up a conversation with the woman in front of him on topics which I did not think suited for such an event. A second antique table joined the first in order to accommodate the overwhelming number of people coming to pay their respects. 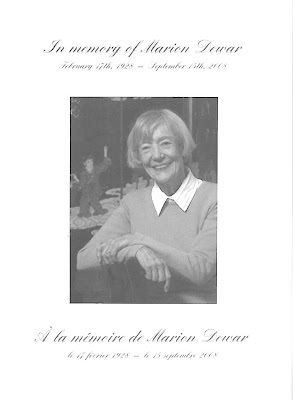 Atop each table was another boquet of white roses, and the former City of Ottawa flag stood aside Ms. Dewar's portrait. Some took long to write their messages, some went quickly. I had already assembled my remark in my head, pausing to sculpt the final draft before putting pen to paper. I picked up a commemorative card as I left. 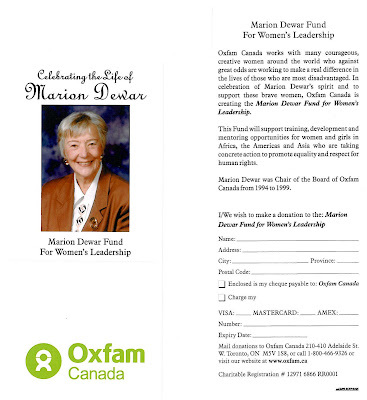 A second card (both cards reproduced below) encourages donations to the Marion Dewar Fund for Women's Leadership at Oxfam Canada, which she chaired from 1994 to 1999. The Centretown Citizens' Community Association's regular board meeting will be held tonight (Tuesday, September 15, 2008) in the Billings room at City Hall at 7 p.m.
- The CCCA Annual General Meeting will be the third Tuesday of October (October 21, 2008). The AGM is usually held at City Hall, although the Special General Meeting this past May was held at Jack Purcell Community Centre. - The CCCA By-Law review have prepared a report (PDF) for Board approval. Here's the North-West corner. If you ask me, this is the most likely to be developed. While it looks like it's recently been refaced, the "Patachi" store is all boarded up and the building empty. Behind it you can see the Chinese apartment building and blue skies. The AVIS place next to it might also be part of the development--"We sell boxes" is an odd marquee for a car rental business, isn't it? Going counter-clockwise, the South-West corner has a fairly sizeable two-storey apartment block. The apartments all seem occupied and the building in decent repair. The South-East corner has a smaller building which may be apartments or condos. The two on the right seem better kept than the two on the left. On the North-East corner is a quite sizeable lot with three automotive businesses: Main Garage, Stinson & Son Ltd, and an Alliance car rental place. In fact, it's such a large lot that I could imagine a developer salivating over it. The Alliance store--really nothing more than a portable trailer and small parking lot--suffered a fire just over a year ago. Below is a photo from the night of that fire. Here's the zoning form the area: The City's eMap application indicates that the area is zoned TM H(15), meaning it is a Traditional Mainstreet, which is designed to incorporate a mix of residential and commercial uses (except auto-related uses), and it has a height restriction of 15 metres. The red shading means that all four corners of this intersection (though interestingly, only a portion of the large apartment block on the South-West corner) have Heritage designation. According to this, the building on the South-East corner is actually comprised of four lots, probably with multiple owners, which explains the differences between the units. Also noteworthy in the CCCA meeting agenda is a search for a webmaster (I inquired, and it seems there is an interested and qualified applicant), and that CCCA members might finally get an e-mail list to discuss issues that affect our community outside of CCCA board and committee meetings. On my way back home from the Byward Market this evening, I went by the Canal and took some nice night shots of the beatiful moon, City Hall, and Lisgar Collegiate. Further on my way home, I saw some lights and sirens on MacLaren and decided to check it out. Interestingly, it was just West of Somerset--the same location as the first entry in this blog! I counted about 60 people outside the entrance and across the street, with others coming and going. Most were calm and chatting amongst themselves, though a couple were noticeably uncomfortable, cold, and eager to get back into their home. I chatted with one group of folks across the street. They said that someone set fire to garbage and sent it down the garbage shute, which--as anyone who's lived in an apartment or condo tower knows--causes smoke to permeate the building. Apparently, this was actually the third time in the past week that this has happened, which would explain why everybody seemed more impatient than nervous. One of the ladies asked me about my camera as I took a couple of photos. She said that she has a digital camera, too, but no computer. She recently bought one of those all-in-one photocopier/printers, which can scan and print photos straight from a memory card. The people at Staples on Merivale were not helpful in her purchase (they insisted she'd need a computer, so she got it at the Staples on Bank in Centretown instead!). Let's hope the folks who live in that tower can get a decent night of sleep, and that the person who set the fires gets a clue and gives it up. As for those photos I mentioned above, I'll post about at some later date, but it was helpful that I had taken them, as it gave me a chance to figure out the right settings to get decent night shots on my consumer-grade camera. I didn't want to spend much time taking photos while in among the crowd. I quite like construction, and I'd post more photos of the various big construction projects in Centretown, if only I had the chance to wade through my hundreds of photos of each one! So when I saw this smaller residential renovation on James Street, I felt it would be more easily blogged. The work also appears to have finished, so it makes for a nice complete story. This next shot is from mid-July. A tasteful patio walkway has been installed, and work was well underway on a new porch. Evidently, the owner agreed, as the whole building was painted biege in late August! Instead of making the house more bland, it actually brought out the geometric accents in the brickwork, giving it a modern, yet cozy, appearance. I hope the person or people who purchase the house will come to enjoy Centretown and feel welcome!